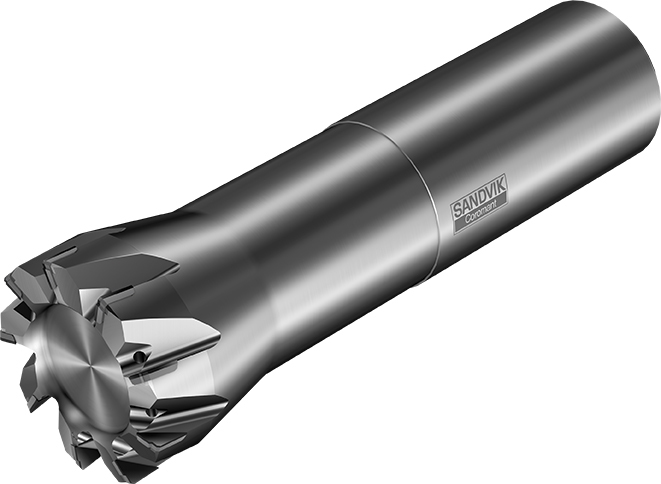 Designed for machining thin-walled aluminum automotive parts without burring, scratching or chipping, the patent-pending M5F90 face-milling cutter is being released by Sandvik Coromant. The two-in-one M5F90 cutter features an innovative design concept that allows roughing and finishing in a single operation, delivering shorter and more efficient machining strategies. The M5F90 cutter body diameter (25–80 mm, 0.98–3.15 inch) carries brazed PCD inserts that, thanks to the application of new production processes, need no adjustment and enable high feed rates without vibration. As a result, the potential time and cost savings available to users are considerable. In addition, no scratches, burrs or breakages are produced on the machined part due to a combination of cutting angles, insert shape, edge preparation and cutting parameters. Notably, roughing and finishing operations are facilitated by a single tool, saving on inventory costs. In terms of roughing, the tool works as a conventional cutter, with all rough-cutting edges positioned on the same diameter and height. The M5F90 is able to machine up to a 4 mm (0.157 inch) depth of cut. With regards to finishing, this portion of the tool consists of radial and axial stepped cutting edges. Such a configuration ensures burr-free milling and outstanding surface finish on thin-walled aluminum parts, while enabling a close pitch in order to avoid cutting vibration. “The inherent flexibility of being able to rough- and finish-mill makes it possible to machine different positions on the same part with just one cutter,” explains Emmanuel David, Global Automotive Product Manager at Sandvik Coromant. “Moreover, the reliable and secure performance of M5F90 delivers superior tool life in comparison to a milling cutter featuring a conventional body. The tool is also environmentally friendly due to its low coolant consumption,” adds Philippe Andre, Global Automotive Application Engineer. Although dedicated to thin-wall milling operations on aluminum parts, such as gearbox casings and housings, the M5F90 is also able to machine large engagement material for applications across the automotive segment. The M5F90 completes the Sandvik Coromant milling cutter offer for aluminum automotive parts, complementing the M5B90, M5C90, CoroMill® Century/590, M5Q90 and M5R90 tooling solutions. Part of global industrial engineering group Sandvik, Sandvik Coromant is at the forefront of manufacturing tools, machining solutions and knowledge that drive industry standards and innovations demanded by the metalworking industry now and into the next industrial era. Educational support, extensive R&D investment and strong customer partnerships ensure the development of machining technologies that change, lead and drive the future of manufacturing. Sandvik Coromant owns over 3100 patents worldwide, employs over 7,900 staff, and is represented in 150 countries. For more information visit www.sandvik.coromant.com or connect on Facebook, YouTube, Twitter, LinkedIn or Instagram.